The Ford Mondeo is a familiar sight on British roads and after testing the 148bhp hatchback, this time it’s the powerful 180PS (178bhp) AWD Estate we are putting to the test. Not only does it have plenty of poke, but it boasts four-wheel drive and the PowerShift auto gearbox. Of course, this comes at a price. This gutsier and higher-spec estate car costs over £6600 more than the two-wheel-drive hatchback we reviewed before. Is it worth the extra? Read on to find out! Even if you only go on caravan holidays in summer, there are good reasons to choose the 4x4 Mondeo over the front-wheel drive. First, given British weather, you never know when four-wheel drive will come into its own. Second, the 4x4 is 94kg heavier than the two-wheel-drive with the same engine and gearbox. That gives a 1703kg kerbweight, and a healthy 85% match figure of 1448kg. So, heavier tourers can be sensibly matched to the 4x4. We towed a twin-axle Swift Expression 626 with a Mass in Running Order of 1413kg. The 2.0-litre diesel can comfortably tow a van of this weight, thanks to its 180PS (178bhp) and 295lb ft of torque. That’s enough for a brisk 30-60mph acceleration time of 11.4 seconds. Even with more low-down muscle than our previous two-wheel-drive test car, the 4x4 is less prone to spin its wheels when pulling away from a damp and slippery junction. It also makes short work of any hill start. The Mondeo’s electronic parking brake held car and caravan still on a 1-in-10 slope, released cleanly, and the strong engine had no difficulty pulling to the top of the hill. The PowerShift automatic gearbox helps, since there’s no need to juggle clutch and throttle when pulling away. It’s an efficient and unobtrusive gearbox while towing at speed. Stability is very good indeed, key when deciding what tow car to buy next. At 60mph the Ford is steady and composed, and we pushed up to 70mph at the test track without any nervous moments. The Mondeo handled the lane-change test well, too. When pushing hard we could feel the car leaning on its outside tyres, but however aggressively we drove, the Ford stayed firmly in charge of the caravan. For many years, each generation of Mondeo has been championed as the driving enthusiast’s choice among family cars. Today’s version drives well, but it’s not quite as communicative via the steering as the previous model. Still, show the Ford a twisting back road and it is very capable. While it may not be quite as entertaining, the new Mondeo is more refined. Aside from some road noise over coarse surfaces, it’s quiet and relaxed. The 2.0-litre diesel is especially impressive – often when car makers squeeze extra power out of essentially the same engine it can become vocal, but the 180PS unit is unobtrusive even when accelerating. The ride is firm but comfortable, even on 18in alloys. The Mondeo is big and practical, but one or two rivals are roomier. Up front, there’s lots of space in the Ford Mondeo. The optional panoramic sunroof (£900) reduces headroom, but you’d have to be a tall driver with the seat set high to really mind. In the back, there’s enough legroom for tall adults to sit comfortably, but both the Škoda Superb and Volkswagen Passat have more rear-seat space so grown-ups can stretch out. That said, the Ford’s transmission tunnel is less intrusive than the VW’s, and it’s good to see air vents between the front seats to keep those in the back cool. Our test car has the optional full-sized spare wheel (£100) instead of the standard mini spare, which reduces luggage space from 500 litres to 488 litres. That’s some way off the 650-litre capacity of the VW Passat Estate. Fold down the seats and the Mondeo’s capacity rises to 1605 litres with the mini spare, or 1585 litres with the full-sized wheel. The Mondeo AWD costs more to buy and run than the front-wheel-drive model. The list price of £29,510 is £1645 more than the front-wheel-drive version, and the official combined economy figure drops from 56.5 to 52.3mpg. Towing the Swift on a mixture of motorways and A-roads we achieved 26mpg. However, on a long tow to Scotland with a fully loaded car and a caravan weighing 1475kg, fuel economy dropped to 23.4mpg. According to our colleagues on What Car?, you can expect to get back 38% of the original price after three years or 36,000 miles. You’ll find better value lower down the Ford Mondeo range, but there’s no arguing with the four-wheel-drive model’s towing ability. 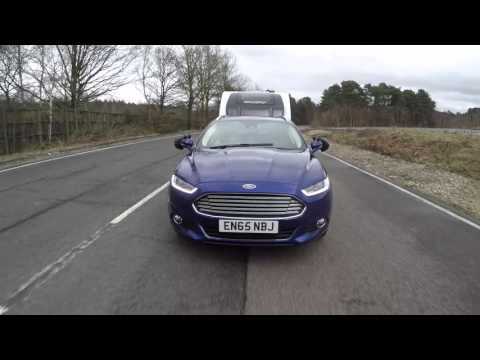 If the two-wheel-drive versions aren’t heavy enough to make suitable tugs for your tourer, or you tow in all seasons and weathers, the Mondeo AWD is a very capable tow car.